NeurotriS microcurrent delivers very low levels of current to the skin in specific wave forms. These wave forms elicit specific biological effects. NeurotriS microcurrent can be used on the face or body to tighten and lift skin. The treatment has been called a “non-surgical face-lift”. The NeurotriS microcurrent procedure diminshes fine lines, creases and wrinkles. It also revitalizes and hydrates the skin, resulting in a smoother softer appearance. Through increased circulation and lymphatic drainage, NeurotriS rejuvenates and tightens skin, reduces under eye dark circles and puffiness, and can even help with acne and rosacea. Drink plenty of water, and do not wear cosmetics or lotions to your treatment. The NeurotriS microcurrent procedure is not uncomfortable. In fact it is relaxing. There is no pain, swelling or downtime. When do I see tesults with NeurotriS microcurrent? Can NeurotriS be used on the body? NeurotriS can be used to tighten body skin as well. What happens in a NeurotriS treatment? During treatment you will recline comfortably in a treatment chair. Your technician will determine which signature frequencies to deliver to the targeted tissues. The microcurrent is delivered with probes, pads, or special gloves. A gel is applied to the skin to enhance conduction. Overall, the treatment is relaxing. You can even sleep. How many NeurotriS treatments do I need? A course of treatment is several sessions. We advise at least four. Maintenance treatments are suggested every four to six weeks. 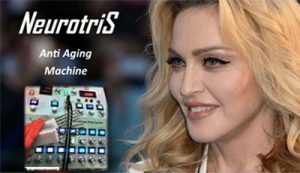 Are there any adverse effects from NeurotriS microcurrent? Microcurrent is safe, without significant adverse effects.